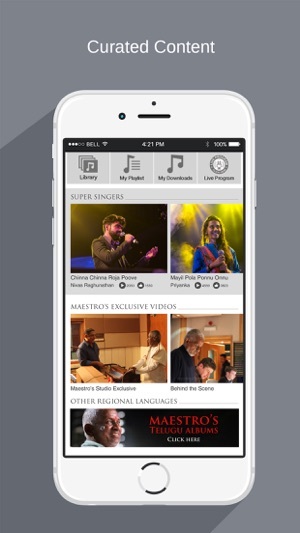 Maestro's Music is the Official Mobile App of Isaignani Ilaiyaraaja. Step into the world of the Maestro and experience the magic for yourself. Feeling nostalgic? Just relive mastered versions of Ilaiyaraaja’s old hits from the 1970s, 1980s and 1990s. Want songs based on your mood? Take your pick from folk songs to peppy dance numbers to soulful ballads with Ilaiyaraaja’s genre-based playlists. Want all your favourite songs in one place? 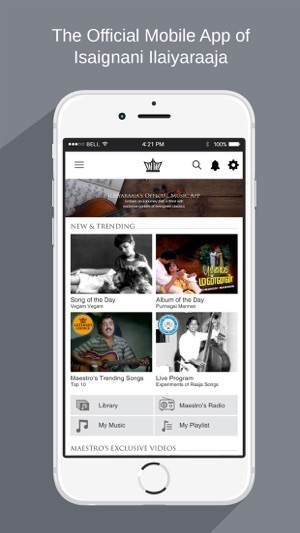 Just download your favourite songs and create your own personalized playlists. Want to discover the next singing sensation? Watch videos of Super Singers performing covers of different chartbusters. Feeling adventurous? 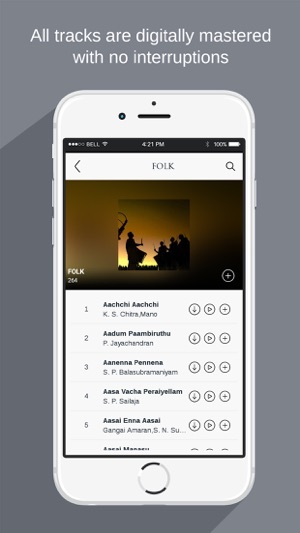 Explore albums and hit songs of Ilaiyaraaja in different regional languages such as Tamil, Telugu and Hindi. Still want more? Well, we’ve got more! Tune in to our daily Live Program with our Celebrity App Jockey and listen to special playlists with an added dose of fascinating insights into the music of Isaignani Ilaiyaraaja. With Maestro’s Radio, Isaignani Ilaiyaraaja’s melodies are always with you, no matter the time of the day. Enjoy access to the latest content, exclusive videos, live recording sessions and interviews of Ilaiyaraaja. And if you’ve ever wondered what the biggest stars of Indian cinema love listening to, just check out our curated Celebrity Playlists. All this in a completely ad-free package. its really sad to see no updates happen for a while just dont lose this its such a splendid repository these are not just collection of songs its a treasure fix issues for ios. This is a nice app having the complete collection, almost, of our Maestros songs. We can create our own playlist too and have unlimited downloads , of course for a annual/monthly subscription! This is now my constant companion during my travels ! Thumbs up..Worth living your day 16 hours with this app..my only paid app ..
Can we have all songs and BGMs please..Missing gems such as Senthoora Poove from 16 Vayathinile, Idhu oru ponmalai pozhuthu, Poonkathave.. from Nizhalgal,Songs of Enakaga Kathiru, etc.. If possible, can we get the song lyrics and songwriter name too please.. Sorry to be greedy, but what is life if I could not enjoy all of my Raja’s works..